Summary: Difference Between HTML and XHTML is that HTML is a special formatting language that programmers use to format documents for display on the Web. You view a Web page written with HTML in a Web browser. While XHTML (extensible HTML) is a markup language that enables Web sites to be displayed more easily on microbrowsers in smart phones and other mobile devices, as well as on desktop and notebook computers. HTML stands for Hypertext Markup Language is a special formatting language that programmers use to format documents for display on the Web. You view a Web page written with HTML in a Web browser such as Internet Explorer, Mozilla, Safari, Firefox, Opera, or Google Chrome. Similarly, XHTML (extensible HTML) is a markup language that enables Web sites to be displayed more easily on microbrowsers in smart phones and other mobile devices, as well as on desktop and notebook computers. XHTML code used to create the Web page. XHTML includes features of HTML and XML. HTML and XHTML are not actually programming languages. In HTML Tags are not extensible but in XHTML they are. 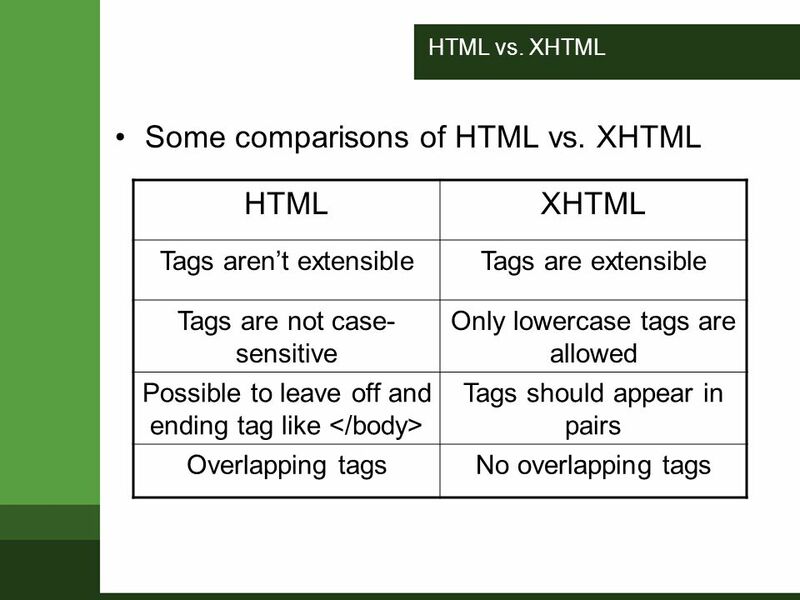 In HTML tags are not case sensitive but in XHTML only lowercase tags are allowed. Overlapping tags are allowed in HTML but not in XHTML. They are, however, languages that have specific rules for defining the placement and format of text, graphics, video, and audio on a Web page. HTML and XHTML use tags or elements, which are words, abbreviations, and symbols that specify links to other documents and indicate how a Web page is displayed when viewed on the Web.